After launching to space on both NASA’s Space Shuttle and then the Russian Soyuz rocket, Sunita (Suni) Williams will be one of the first female NASA astronaut to fly onboard the new US commercial vehicles being developed. Suni, who formerly held the record for the longest EVA (spacewalk) time by a female astronaut, was chosen along with astronaut colleagues Robert Behnken, Eric Boe and Douglas Hurley to be the first 4 NASA astronauts to fly aboard the future Boeing CST-100 and SpaceX Crew Dragon spacecraft. [Update]: In August 2018 it was announced that Suni would fly alongside fellow NASA Astronaut Josh Cassada to the International Space Station (ISS) on the Boeing CST-100 Starliner first post-certification flight. The first female NASA astronaut to fly to the ISS on a US commercial crew vehicle will be NASA Astronaut Nicole Mann, alongside NASA Astronaut Eric Boe and former NASA and current Boeing Astronaut Chris Ferguson. Nicole is set to fly onboard the Boeing CST-100 Starliner’s upcoming crewed flight test. Suni’s ISS flight will follow this flight test and will be a long-duration six-month flight onboard the ISS. Boeing and Space X were awarded contracts by NASA in September 2014 worth $4.2 billion and $6.2 billion each respectively, to develop the next generation of crew transportation to low-Earth orbit. The 2015 crew selection announcement was made by NASA Administrator Charles Bolden with the selected astronauts including Suni training with the commercial carriers. 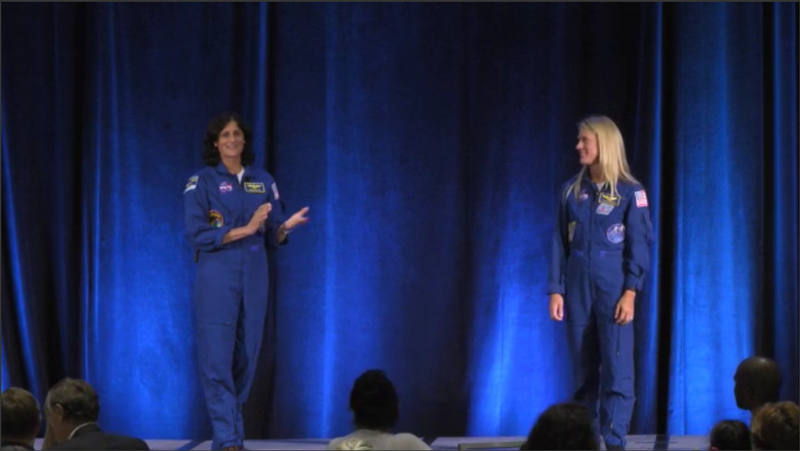 Coinciding with the announcement, Suni appeared on stage with fellow NASA astronaut Karen Nyberg to present an inspiring keynote address at the International Space Station Research & Development Conference (ISSRDC). 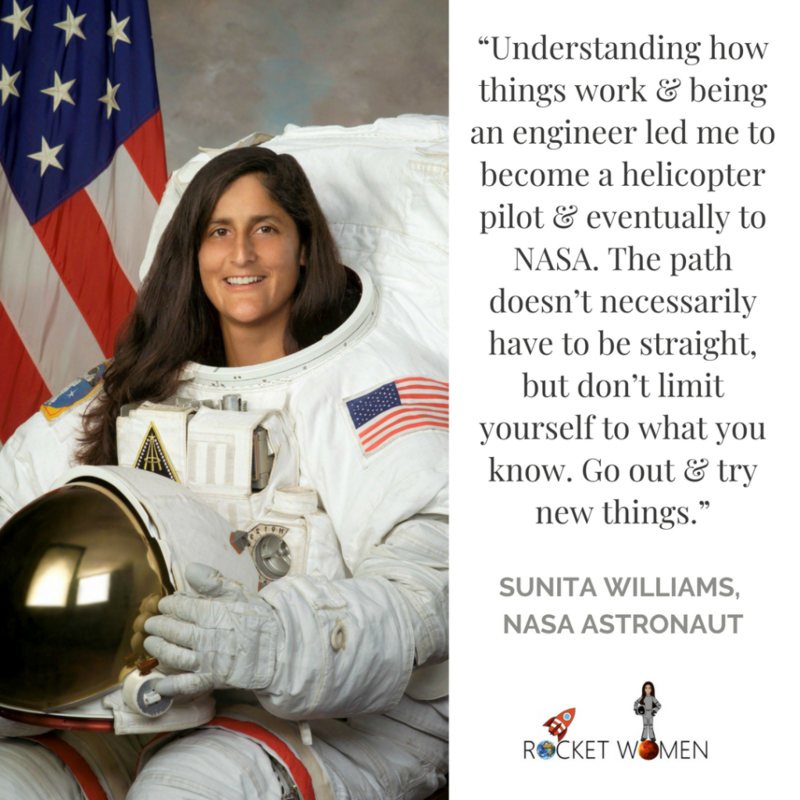 Suni discussed career advice for aspiring astronauts, emphasizing that “Understanding how things work and being an engineer led me to become a helicopter pilot and eventually to JSC. The path doesn’t necessarily have to be straight, but don’t limit yourself to what you know. Go out and try new things. Some of those things when I was young I would’ve considered a failure, but you just need to get to the starting line.” Karen added that her older sister used to laugh and say it was cute when she said she wanted to become an astronaut. However after an internship at NASA Johnson Spaceflight Center she knew that it was the career path for her ,“and here I am”. Suni’s next piece of advice was, “Don’t forget the things that you learnt at Kindergarden”. She recalled the experience of living on the ISS with “people from different cultures and backgrounds, people from all over the world”. Suni’s first mission to the ISS as part of a Soyuz crew of 3, was with an American and Russian, with her most recent with only Russian cosmonauts. She highlighted the international nature of spaceflight through her experience of training with an ESA astronaut and acting as backup crew for a Canadian & Russians. Suni described the sometimes stereotypical view, especially outside of North America that, “Canada, you think just above, is close to being American, but it’s very different.” She also sometimes forgot that her Japanese crewmember was from Japan, as he went to school in US. She described her 6 month missions on the ISS as “a marathon not a sprint”. She discussed the fact that astronauts have to prepare for any incidents that happens on the ISS when the crew are asleep, with the ISS systems and controllers waking the crew up at night if anything was happening. Before her flight she wanted to make sure she was prepared. Discussing the nuances of international work culture, her Japansese crewmate, Aki Hoshide, wanted to “just work Japanese style” Amusingly Suni finally got him to stop working by putting on the TV show Family Guy at 6pm. Karen added that her philosophy was to “Always do your best. Always clean up after yourselves. Admit you’ve made a mistake”. 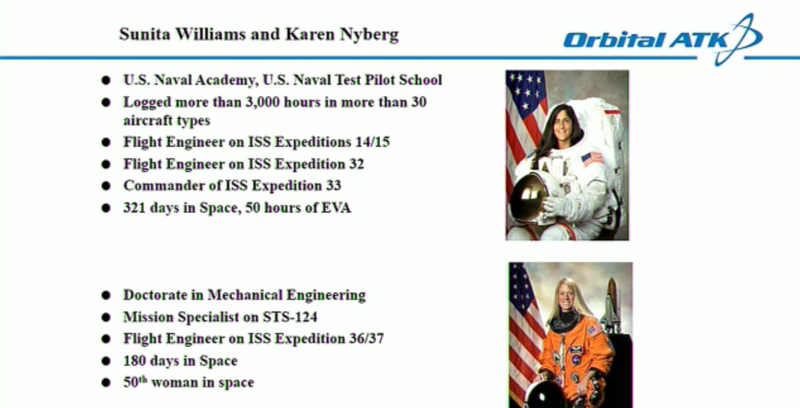 She described astronauts on the ISS as being a “Jack of all trades up there, including scientists. For some science, we get the experiment rack up and running and leave it alone. Sometimes we get to talk to PIs (Principle Investigators)” which is her favourite time. She said that during her work on the ISS she was “always thinking about the people on the ground and doing her best, knowing how important that experiment is to that person”. Karen admitted that once she “changed up” the wrong igniter in combustion rack and delayed their research for a long time, feeling so awful afterwards. She went on to describe a popular topic fielding questions. “Urine collections is a technique.” Her first time attempting this, “was a disaster, I made a mess, and used so many dry wipes than allocated. By end it was easier with a hose and I got better with it.” But she missed the first data point for the research and knew that “data means so much to them”. “Urine collections is a technique.” Karen’s first time attempting this, “was a disaster, I made a mess, and used so many dry wipes than allocated. By end it was easier with a hose and I got better with it.” But she missed the first data point for the research and knew that “data means so much to them”. Suni’s third lesson to the audience was to “Stop and take a look at the foliage. Just take a moment out and enjoy the journey”. She depicted coming back to Earth on the Soyuz as, “Anti climatic when you’re leaving the ISS and closing the hatch, in long underwear and doing leak checks.” You think “something’s exciting’s going to happen, then undock and sit there for whole orbit with the list of tasks in front of you.” She empathetically depicted the “ride home” as spectacular. “Your face is this close to the window and us knuckleheads are close to the fire. Russians in the middle seat. I was in the left seat, starting and stopping the procedures, not wanting to mess it up.” After deorbit burn she described the crew seeing pink outside the window and the window cover dramatically burning off. “The pyros are going off, we can’t talk to the ground. Then things calm down, the parachute deploys and you’re the walnut bouncing around.” Suni hoped the commercial crew that she had recently been selected to fly with, takes a note and learns from the Russians. Suni’s advice was to enjoy the time in space and the journey, mostly enjoying the work with the scientists on the ground. 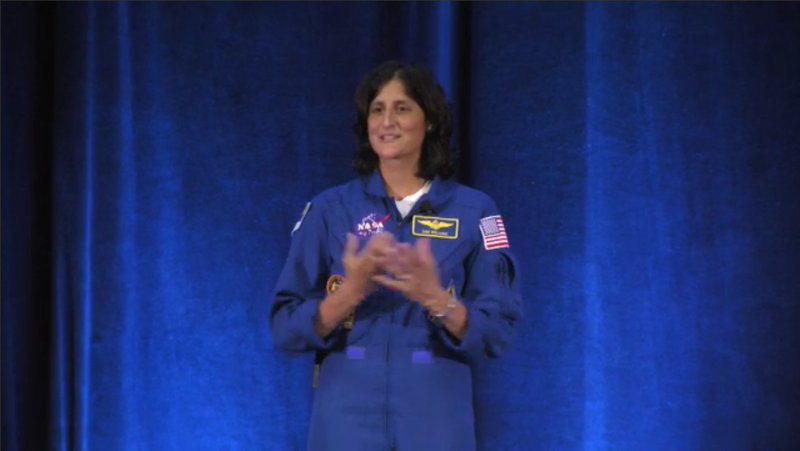 Astronaut Sunita Williams summed up the sole reason for her outreach activities, “We’re trying to inspire the next generation”. She summed up the sole reason for her outreach activities, “We’re trying to inspire the next generation”. 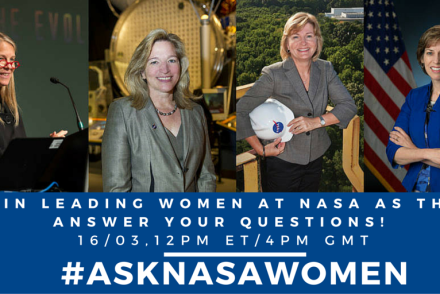 Leading [email protected] Answer Your Questions!